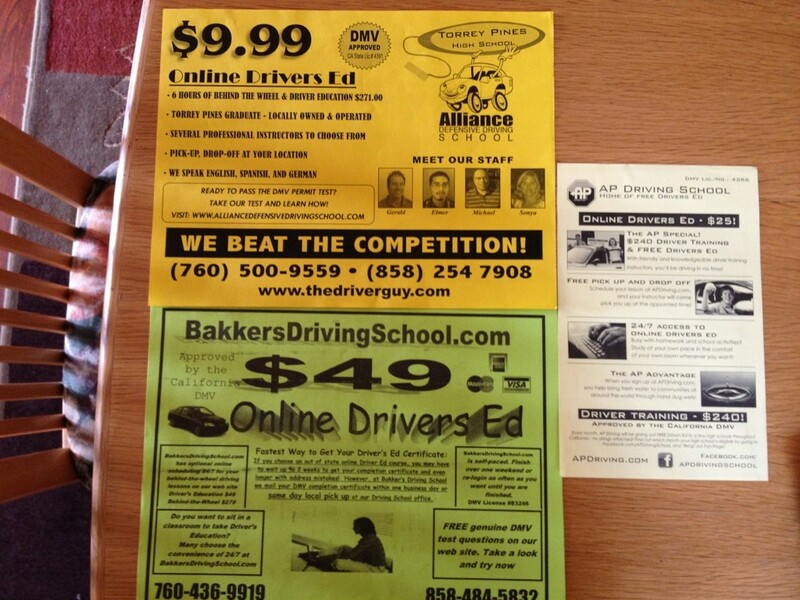 Need consumer reviews on San Diego Driving Schools – Trees & Flowers & Birds! OK San Diego locals – HELP! Even though Alex still needs to earn a proper GPA in order to get his complete license, I do want to get him signed up and ready to get his permit so he can start lessons and practicing. However, which company should I use? I get these three flyers in the school newspaper every month. Same three. I’ve heard of Bakkers – that’s who we used for my older son but this was before there was an online option – he hated the classes as all teens do but I honestly don’t remember being either thrilled or angry with them. Yet the majority of online reviews I find are bad. There was ONE good one. The rest were all pretty nasty. So, I hesitate and ask you guys – which one should I use? Is there another one that doesn’t send flyers that you recommend? I really really want personal recommendations and reviews here. If you don’t want to put anything in comments for whatever reason (which you can do anonymously though that defeats the purpose of me knowing the reviewer.) you can email me directly at christina010365@gmail.com. We did Bakkers and it was fine. My older kids did the classes in the class and my youngest online–can’t say I saw a difference. In the end, I think Mom does most of the teaching!